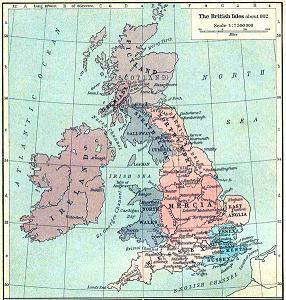 Medieval Britain compromised the area that is now Scotland, England and Wales. The Romans, who successfully invaded most of Britain in the 1st century, were finally expelled four hundred years later. They left behind a massive network of roads which included several bridges. They were also able to completely override the previous British religions with Christianity. Most settlements were very prosperous when most Roman legions abandoned Britain. This made Britain a stable nation in the very early Middle Ages; since, in most cases, they fully adopted Roman customs and ways of life. However, Britain was divided in three and desire for power caused the next two centuries to become among the worst in British recorded history.